The section of the Trans-Siberian Highway between the cities of Chita and Irkutsk in Western Siberia features stunning mountains dotted with Buddhist temples and rural villages. Starting at the Sea of Japan, the Trans-Siberian Highway curls around northern China on a rough and sometimes unpaved road called the Amur Highway. Past the city of Chita, the road improves and motorists enter a fascinating part of Russia called “Transbaikalia.” Located in the Yablonovy Range, the highway here rises up into forested mountains and dips into river valleys where it is easy to park and camp. Transbaikalia’s capital Chita is a delightful city with an enormous central square, a striking church and a fascinating history. If you’ve just completed the long journey on the Amur Highway, Chita is a modern city where you can stock up on supplies and enjoy a night’s rest in a hotel. Many of the Decembrists—a group of young military officers who led an unsuccessful 1825 rebellion against the Tsar in St. Petersburg—were exiled to Chita and other places nearby. While in exile, many Decembrists were joined by family and their relatively lenient sentences provided them with time to organize concerts and cultural events in their new homes. While in Chita take a stroll through Lenin Square, a sprawling plaza with one of the largest Lenin statues in Siberia. The city’s Decembrist Museum , located in a beautiful 18th-century log church, has exhibits on the lives of the famous revolutionaries. With a good map or GPS, you could spend days exploring the mountains around Chita. Australia-based Russia Tour can organize a guided trip to the isolated mountains south of Chita. The Hotel Montblanc in Chita is right near Lenin Square, has a private parking lot and immaculate rooms that start at around $80 a night. The section of the Trans-Siberian Highway between Chita and the city of Irkutsk is known on local road signs as the M-55. From Lenin Square, drive straight on ul. Lenina. The street names change twice, but it leads directly to the M-55. Driving west you soon reach the outskirts of Buryatia, home to the Buryat people, the largest indigenous group in Russia. Once a nomadic people that trace their roots back to the Mongols, Buryats are practicing Buddhists and their prayer flags hang from treetops along the M-55. The town of Petrovsk-Zabaikalsky (460 kilometers, six hours from Chita) is a short drive from the official border with Buryatia. Many Decembrists were exiled here. The Decembrist’s failed revolution was inspired partly by their participation in the Napoleonic Wars and trek to Paris. The center of Petrovsk-Zabaikalsky looks like a large French town with tall brightly painted buildings, part of the European influence the Decembrists left behind. A short drive west of Petrovsk-Zabaikalsky, you enter Buryatia. The curled pagoda roofs of “datsans,” or Buddhist temples, appear in the hillsides. It’s not uncommon here to see local Buryat men on horseback galloping along the grasslands below the mountains. While driving through Buryatia, stop at a roadside cafe to try a “pozhe,” a Buryat dish of dumplings filled with ground lamb and onions. The best cafes to get a pozhe in Buryatia feature signs reading “poznaya,” signifying they specialize in this local delicacy. Ulan-Ude, the capital of Buryatia, is a bustling city 200 kilometers from Petrovsk-Zabaikalsky. A 25-foot bust of Lenin’s head—the largest of its kind—is mounted on a stone pedestal on Ulan-Ude’s central square. The UU hostel in Ulan-Ude is an affordable option for spending a few days in the city with free parking and a kitchen. The Ivolginsky Datsan is a short drive from Ulan-Ude through a pristine valley. Visitors follow a pathway that encircles the monastery. On the way, stop to spin the prayer wheels—tall, wooden cylinders on spindles—located between each building. Also worth visiting is the Open Air Ethnographic Exhibition , a large outdoor museum near the city. It contains archeological displays, reconstructed Buryat dwellings and several magnificent wooden churches topped with lustrous silver domes. 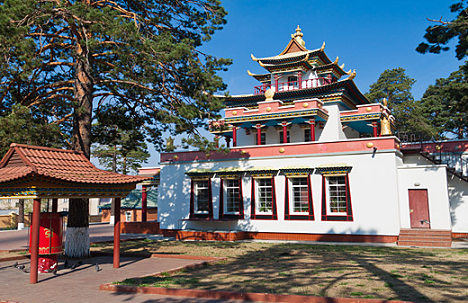 Many remote Buryat villages with rarely visited Buddhist temples lay just outside of Ulan-Ude. Ask the staff at UU Hostel for tips. To go to Mongolia take highway A165 just south of Ulan-Ude to the border. Those heading onwards across Siberia will follow the M-55 north to Lake Baikal, the world’s largest lake. Babushkin, (2.5 hours, 180 kilometers from Ulan-Ude) is the first town you will reach at Lake Baikal. Stop for a picnic on Babushkin’s lovely beach of smooth rocks that looks out over the lake. In Babuskin and many towns along the southern shore of Baikal you can park your car near the beach and pitch a tent. Camping on Baikal’s beaches is one of the highlights of traveling along the Trans-Siberian Highway. West of Babushkin, the M-55 hugs tall cliffs that overlook secluded coves of aquamarine water. One of the tallest and most dramatic stretches of mountains on the entire Trans-Siberian Highway separates Baikal from the nearby city of Irkutsk. Plan on driving to Irkutsk by day so you can stop to admire the mountains on your way into the city. Check your brakes before attempting the long descent down the mountains into Irkutsk. From here on the landscape flattens and the Trans-Siberian Highway continues through rolling hills and steppe. You’re about to enter a very different part of Russia.